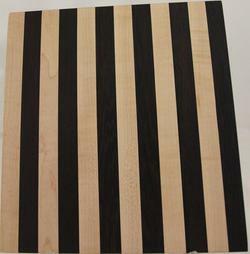 Many cutting boards are available. 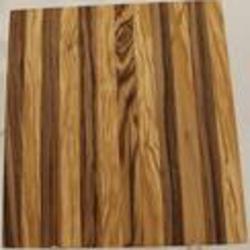 Exotic woods are used in most of them, most are all exotic woods, some have domestic Bird's Eye Maple, or Tiger Tail Maple in them. 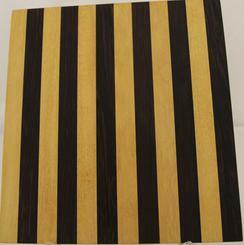 The appearance varies by color of wood, the grain and the arrangement of the woods. When you see a piece you want look at the numbers in the upper right hand corner, you will find it in the store with those numbers, if it is not marked sold. If you like a particular wood or woods and want just that combination & or a particular size please CONTACT US so we can get you what you want. 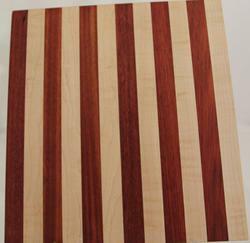 The two cutting boards on the left contain a 132 piece combination of Walnut and White Maple. 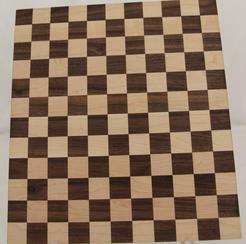 Depending how the the board is turned the checkered affect is slightly different. The far right has 12 pieces of exotic woods: Olive Wood and Zebrawood. They all measure approx. 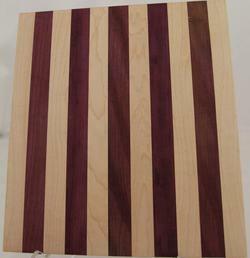 11"W x .75"D x 12"H.
The six cutting boards above all contain exotic Fiddleback Purpleheart and White Maple. The first four have 11 pieces of wood and the last 2 have 12 pieces of wood. 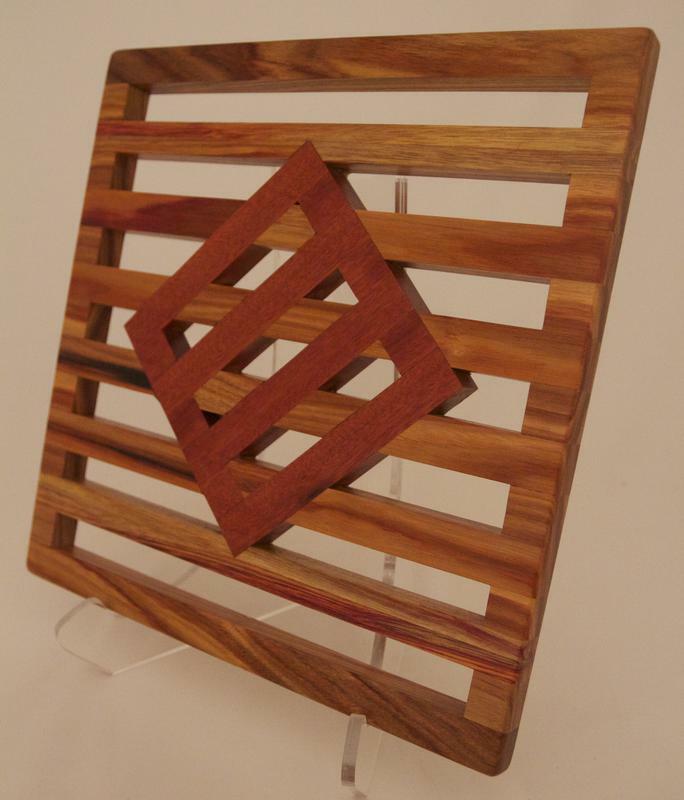 The arrangement of the wood gives a slightly different look making each "one of a kind". They measure approx. 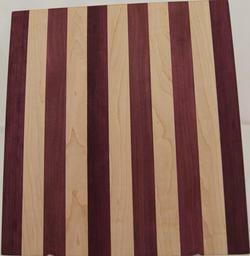 11"W x .75"D x 12"H.
The 12 cutting boards above all contain 12 pieces of exotic wood, except the white maple. 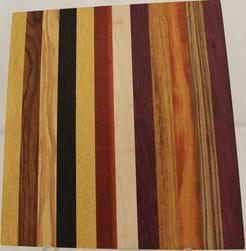 The exotic woods are: Amboyna, Brazilian Rosewood, Canary wood, Olivewood, Panga Panga, Pau Amarello, Purpleheart, and Zebrawood. 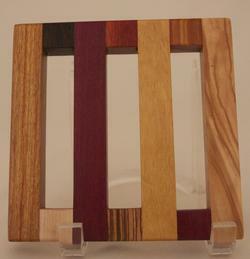 The colors and grain of the wood as well as the arrangement of the woods give each a "one of a kind" appearance. Also, the number of pieces of the same wood affect the color effect. 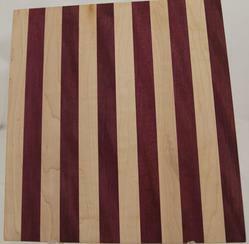 The grain of the woods also add drama to the total effect of the cutting board. They all measure approx. 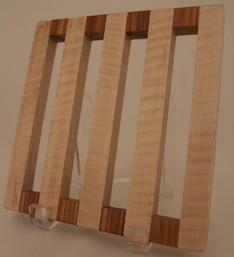 11"W x .75"D x 12" H.
All three of the above boards have 12 pieces of wood in them. They all have domestic White Maple. The 2nd wood in each is an exotic wood; the far left has Yucatan Rose Wood, the center has Brazilian Rosewood, the far right has Amboyna. They all measure approx. 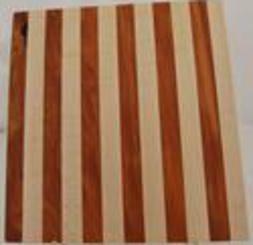 11"W x .75"D x !2"H.
The three cutting boards above all have 12 pieces of exotic wood except the center which has domestic White Maple. The far left has Panga Panga and Pau amarello; the center has Panga Panga also. The far right has Pau Amarello and Yucatan Rosewood. They all measure approx. 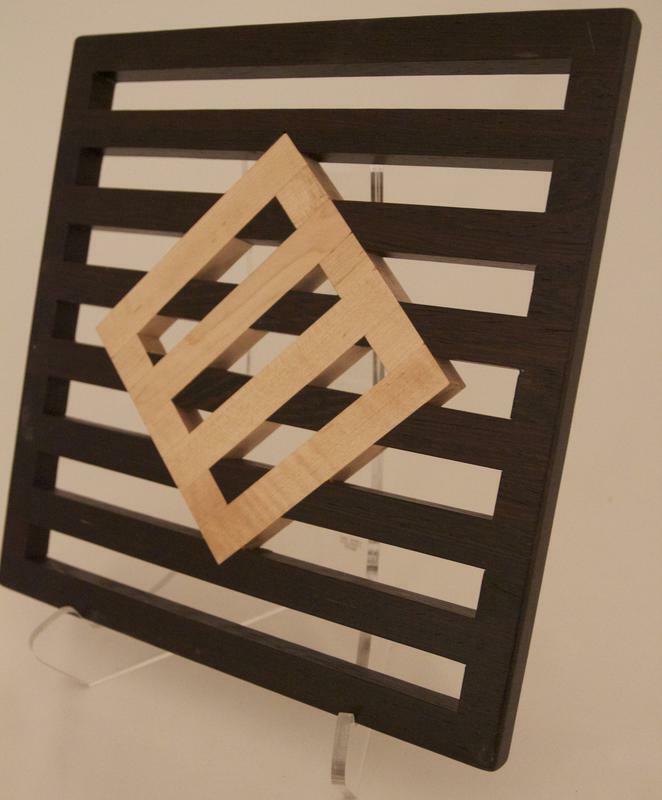 11"W x .75"D x !2"H.
These 2 trivets have 42 pieces of wood in each. They measure 11.5" x 11.5" x .75". The one on the left has white ash and walnut domestic woods. On the right is Panga Panga an exotic wood, and white ash. The grain adds visual interest to each one making them very individual. 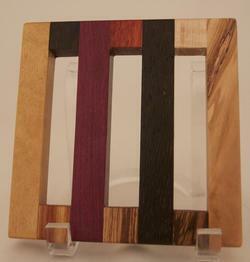 These three trivets all contain 42 pieces of wood. They measure 11.5" x 11.5" x .75". The two on the left are made of exotic wood Panga Panga and domestic wood white ash. The arrangement of the wood creates the different look. The one on the right is made of exotic woods: Bloodwood and Canary wood. These two trivets have 22 pieces of wood in each. They measure approx. 11" x 11" x .75". The one on the left is made of Panga Panga, an exotic wood and white ash. The one on the right is made of domestic woods: white ash and walnut. 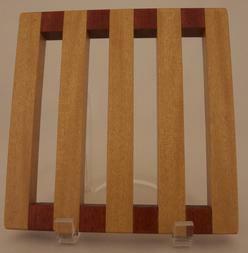 These three trivets contain 10 pieces of wood each. They measure approx. 5" x 5" x .75". The one on the left and the one on the right have exotic woods: Bloodwood, Canary wood, Olive wood, Panga Panga, Pau Amarello, Purpleheart, and Zebra wood, and white ash a domestic wood. 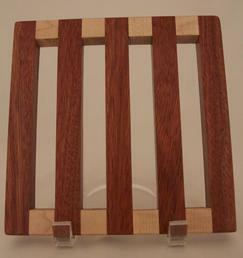 In the center the trivet is all Bloodwood an exotic wood. Due to the grains and the amount and arrangement of the different woods each is very unique. 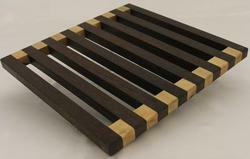 These 5 trivets have 13 pieces of wood in each. They measure 7" x 7" x .75". 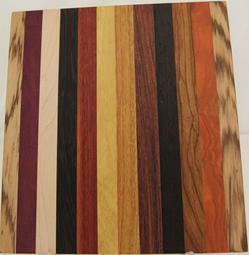 The top left contains exotic woods: Bloodwood, Panga Panga, Pau Amarello, Purpleheart and Zebra wood and white ash a domestic wood. 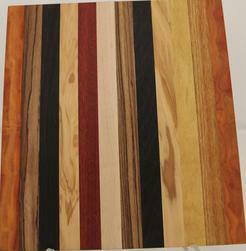 The top right has exotic woods: Bloodwood and Pau Amarello. 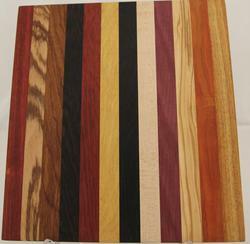 The bottom left contains exotic Panga Panga and domestic white ash. The center has exotic Canary wood and domestic white ash. The right exotic Bloodwood and domestic white ash.The grain of the woods and the arrangement of the wood make each one very unique. 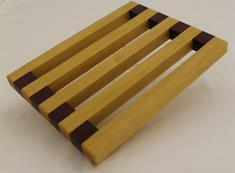 This trivet contains Panga Panga an exotic wood and white ash a domestic wood. 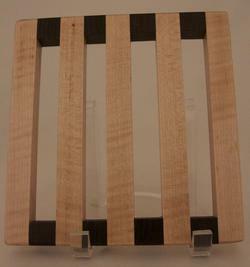 It measures approx, 5" x 5" x .75" and contains 10 pieces of wood. The contrast in color makes it very interesting. 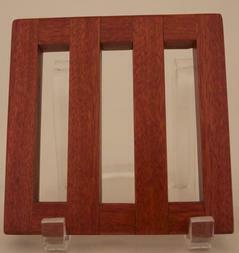 13 pieces of wood compose this trivet from exotic woods: Bloodwood and Pau Amarello. The grain of these woods is very subtle. It measures 6.75" x 8.25" x 75". 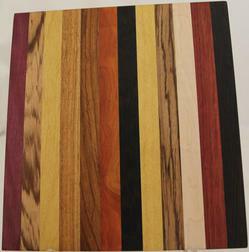 These 5 cutting boards contain 12 pieces of exotic woods: Bloodwood, Canary wood, Olive wood, Pau Amarello, Purpleheart, Wenge, & Zebrawood. 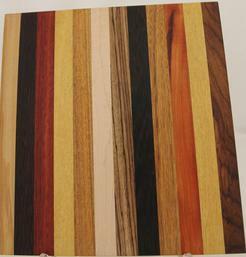 The arrangement of the wood pieces and the grains give each board it"s individual appearance. 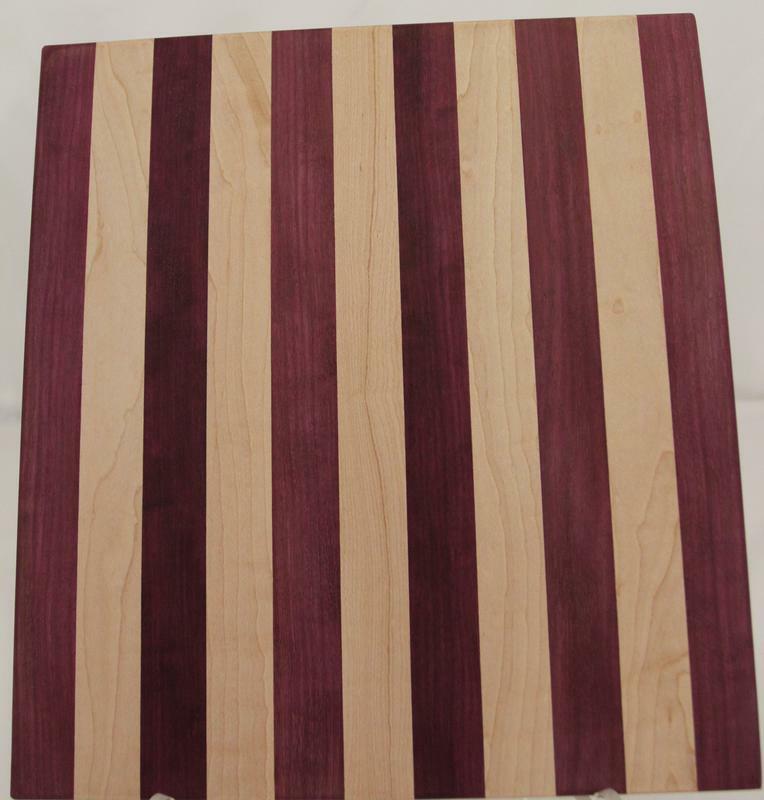 They all measure 11"W x .75"D x 12"H.
These three cutting boards contain exotic woods: Blood wood, Canary wood, Olive wood, Pau Amarello, Purpleheart, Wenge, & Zebrawood. The one on the left has 9 pieces of wood & is 8"x12"x.75". 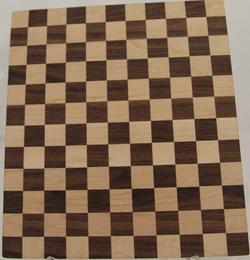 The center has 15 pieces, measures 14"x19"x.75". The right has 20 pieces & measures18.5" x 19.25" x .75" This board has been sold, however the color combination and arrangement may be recreated, the grain would be different. Again the arrangement of the wood and grains create the design. 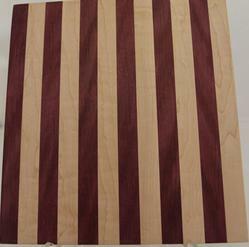 The two cutting boards above have 11 pieces of wood in each. 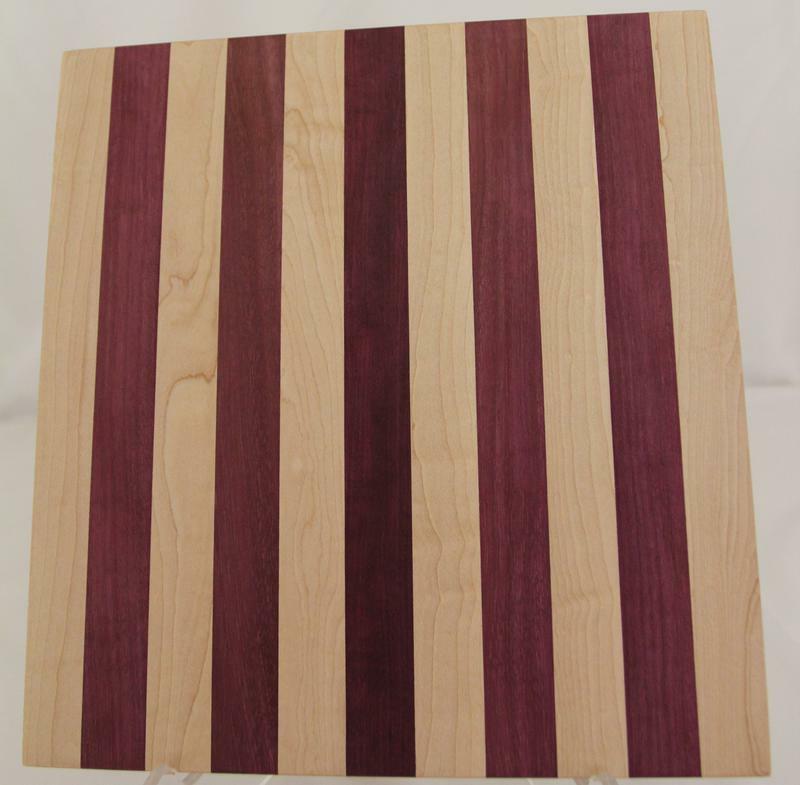 The arrangement of the wood and this purpleheart having a fiddleback grain gives them an extremely beautiful look. The board on the right has the same number of pieces of wood on the left but because it is 1/4 sawen it is narrower and thicker than the one on the left. The eight cutting boards above have 11 pieces of wood in them. They are all exotic woods: Brazalian Rosewood, Canary Wood, Honduras Redheart, Olive Wood, Panga Panga, Purpleheart, Wenge, Zebrawood. The arrangement of the wood and the grain that is exposed creates the different looks. 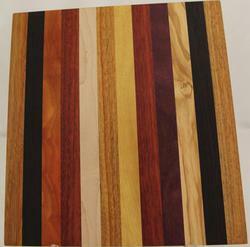 This special order cutting board is made of exotic woods: Olive wood & Padauk. It contains 12 pieces of wood. It measures 12"W x .75" x 18"H.
The 3 cutting boards above are made of 13 pieces of exotic Padauk & domesic Birdseye Maple; Padauk & Olive wood; and Monkey Pod & Tiger Tail Maple. The grain in each wood is very different making each one "one of a kind". They measure 12" x 18". They are $ 95.00 each. The 2 cutting boards above are of Padauk (Africa) and Birds Eye Maple (N America) on the left, on the right is Monkey Pod ( C & S America) and TigerTail Maple ( N America). The grain of the woods is very dramatic and the colors enhance each other. 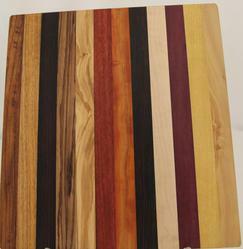 ​All the cutting boards below contain exotic woods: Black Limba (Africa), Bloodwood (C& S America), Bubinga (Africa), Canarywood (S America), Katlox (Mexico), Monkey Pod ( C&S Amerrica), Olivewood ( M East), Padauk (Africa), Panga Panga ( Africa), Pau Amarello (S America), Purpleheart (S America), Zebrawood (Africa). 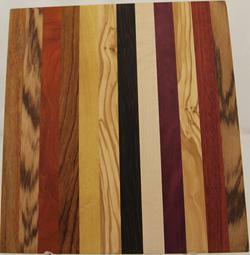 The exotic woods contain very beautiful colors and dramatic grain. 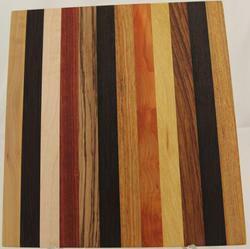 ​All the cutting boards below contain 12 pieces of exotic woods: Black Limba (Africa), Bloodwood (C& S America), Bubinga (Africa), Canarywood (S America), Katlox (Mexico), Monkey Pod ( C&S Amerrica), Olivewood ( M East), Padauk (Africa), Panga Panga ( Africa), Pau Amarello (S America), Purpleheart (S America), Zebrawood (Africa). 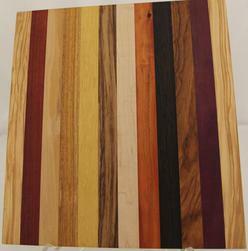 The exotic woods contain very beautiful colors and dramatic grain. They are approx 11" x 12" x 5/8" thick. $65.00 each. The Cutting Boards above are approx. 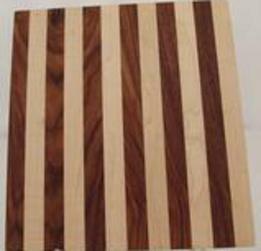 5.5" x 5.5" x 5/8"a perfect size for small tacks in the kitchen or serving cheese, meats. The are made of exotic woods so the colors are the natural color with the beautiful grains being different in each piece and from side to side. The woods are indicated below the boards. The boards are signed, dated and numbered. The number in the upper right corner is that number. They are $30.00 each. 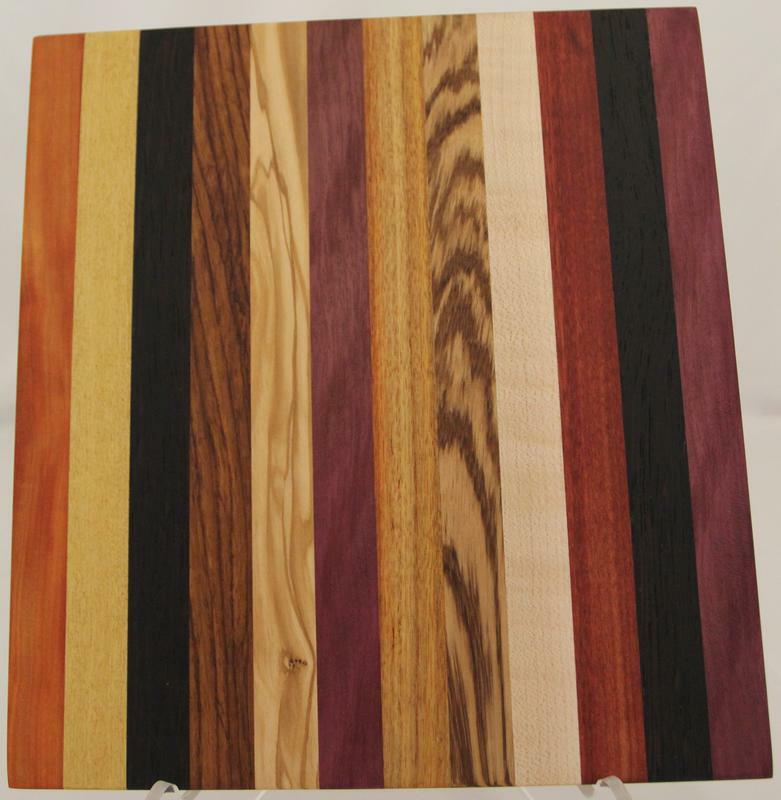 # 6333 Left to Right: Paduak (Africa), Zebrawood (Africa), Bubinga (Africa), Purpleheart (C & S America), Black Limba (Africa), Purpleheart (C & S America). 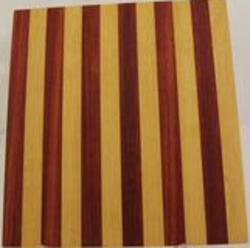 Right to Left Canarywood (S America), Padauk (Africa), Pau Amarello (CAmerica), Olivewood (Europe & C Africa), Panga Panga (Africa), Katalox ( Mexico). # 6332 Left to right Canarywood (S America), Padauk (Africa), Pau Amarello (CAmerica), Olivewood (Europe & C Africa), Panga Panga (Africa), Katalox ( Mexico). 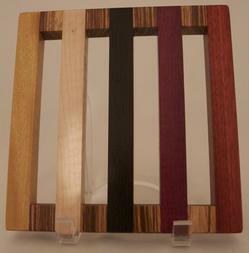 # 6334 Right to Left: Paduak (Africa), Zebrawood (Africa), Bubinga (Africa), Purpleheart (C & S America), Black Limba (Africa), Purpleheart (C & S America).